Who is Gomtec, ABB's latest acquisition? ÉTS : Control and Robotics Laboratory : Blog : Industrial robots : Who is Gomtec, the collaborative robotics company acquired by ABB? Indeed, Gomtec is a 25-employee firm based not far from the German Aerospace Center (DLR), from where it all started. The company was primarily owned by Bernd Gombert, a prolific 55-year-old mechatronics engineer with more than 100 patents and serial entrepreneur. Gombert worked at DLR as a researcher from 1989 till 2001, and one of his projects was the development of the LBR (now commercially available as KUKA’s LBR iiwa). In 1991, he invented the 3D mouse and founded Space Control GmbH, which was eventually sold to Logitech (currently 3Dconnexion). In 2000, he founded eStop GmbH to commercialize electromechanical brakes for the automotive industry. Siemens VDO acquired the company in 2005. Then in 2008, eStop’s core team left and founded RG Mechatronics, which was essentially a consulting firm. In November 2011, AVRA Surgical Robotics, a US corporation who wanted to develop a surgical robotics system, approached Gombert. To pursue development of the surgical robot, a newly created subsidiary, MIS Robotics, entered into an agreement in October 2012 with RG Mechatronics, whereby the latter agreed to conduct the development and manufacturing of the surgical robotics system. In the next six months, AVRA provided to its subsidiary loans totaling over US$4.5 million. But, by the end of 2012, the funding arrangement started to become troublesome. 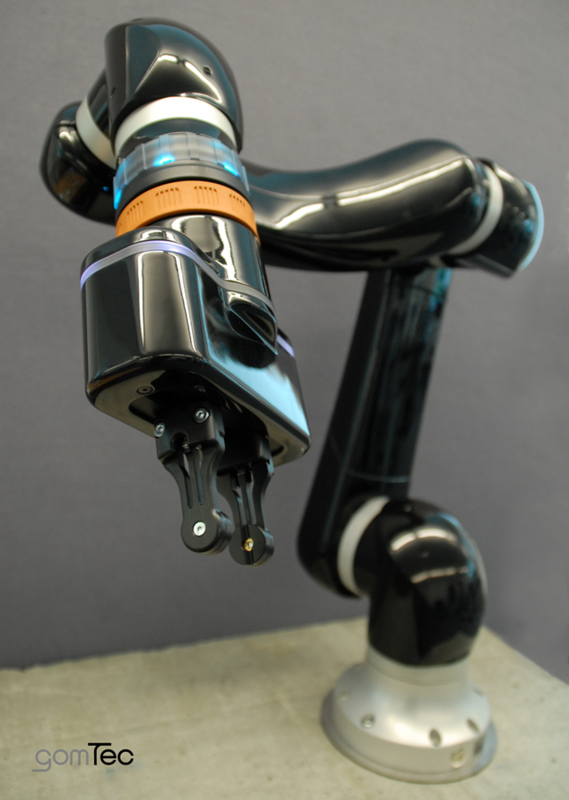 Eventually, Gombert terminated his connections with AVRA in March 2013, but in the meantime RG Mechatronics developed the surgical arm. Later that year, Gombert acquired RG Mechatronics GmbH and started converting the surgical arm into an industrial collaborative robot. 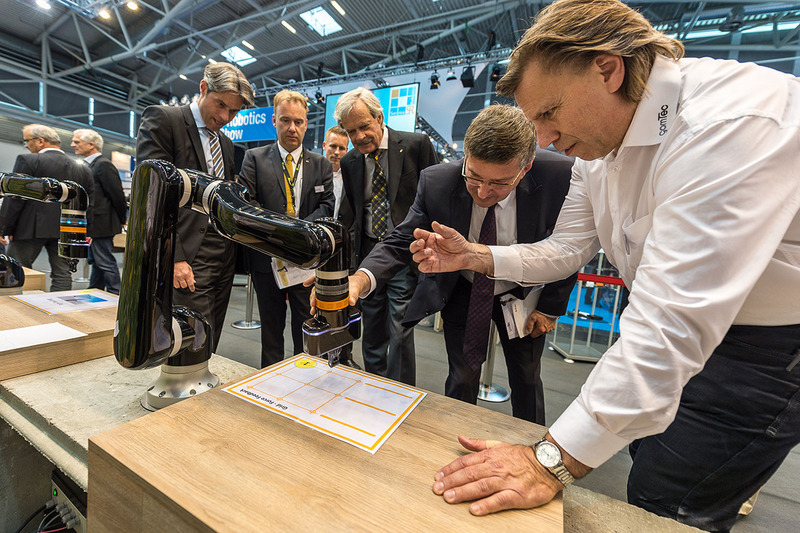 In April 2014, RG Mechatronics GmbH was renamed Gomtec GmbH to reflect “the change in commercial direction from consulting engineers to robot manufacturer.” Then in June 2014, Gombert unveiled its collaborative robot arm at Automatica 201 (see photo bellow), right next to KUKA’s booth. Gomtec’s robot is actually a family of six-axis modular collaborative robots, called Roberta, with base pricing between €27,900 and €32,700. The lightweight robots use custom-made brushless motors and harmonic drives. They come with an optional simple two-finger electric gripper or an advanced one with integrated cameras, an optional 6D input device with an illuminated rotating ring called RoboCommander, an optional force/torque sensor, and an optional safety package. The robot’s links are made of aluminum and covered with plastic coating. The robot has no torque sensors in its joints, unlike KUKA’s LBR iiwa. Gomtec used KEBA’s KeMotion robot controllers for their collaborative robot arms, so it will be relatively easy to switch to ABB’s IRC5 controllers. I can’t help but admire ABB’s swift business decision to acquire Gomtec. With YuMi for handling small parts (500 g) and the Roberta family of collaborative robot arms (which will certainly be renamed) for larger payloads, ABB suddenly became a major player in the field of collaborative robots and a direct competitor to Universal Robots. However, although RAPID is one of the best robot programming languages, ABB will now have to develop intuitive programming user interfaces for their collaborative robots. Otherwise, you would need a college course like mine to learn how to use these robots.